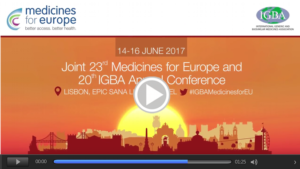 The Joint 23rd Medicines for Europe and 20th IGBA Annual Conference will unite over 300 experts from the generic and biosimilar sector to provide market trends, innovative commercial strategies, new updates and opportunities for growth for affordable medicines. At this unique event the participants will not only gain new information but will also have the opportunity to enjoy many enjoyable networking get-to-gethers in the beautiful surroundings of Portugal’s capital Lisbon! What is the status of pricing & reimbursement policies around Generic, Biosimilar and Value Added medicines in the developed markets? How can international cooperation deliver safer and better medicines to patients? How to position your messages on a social media platform: #AccessHealth, what’s behind a hashtag?